Working to preserve, protect and promote the White Pomeranian. After having spent more than 20 years doing so, I can say with conviction that they’re the most difficult colour of all Pomeranians. Too much white breeding in the pedigree and the white Pomeranians revert to the older style Pom. It’s an incredibly difficult task to create pure Pomeranians of high quality and type, with icy white colored fur coats. It was a simple accident that caused Dochlaggie to begin to Breed the White Pomeranian. The whites started after importing an English white male Pomeranian. This specific male came from mainly Hadleigh lines and by extensive pedigree research, we discovered whites from South Africa and the U.S.A. existed many generations back. By mixing white with the blacks, cream and wolf sables, we managed to create pure white Pomeranians. A great deal of thought and care selecting complementary coloured females with high quality bloodlines that would create quality ice white Pomeranians. The primary goal at Dochlaggie is to breed high quality Pomeranians. We’re certainly not keen on the idea for breeding lots of white puppies to satisfy the enormous demand. Dochlaggie refuse to sell any Pomeranian to “breeders” whose sole focus is to breed as many pups as possible, regardless of quality. If your white dog does have shadings, it can be virtually impossible to be bred out further down the line. According to the Pomeranian standard breed,” whites aren’t permitted to have any other colors at all. 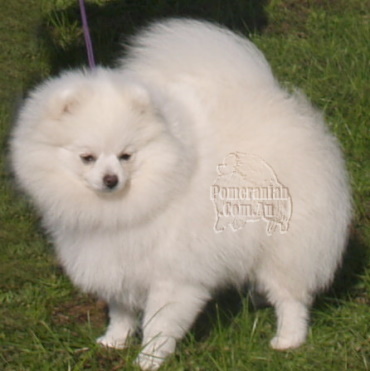 At Dochlaggie, we use cream and wolf sables to help pale coat color of the Pom’s coat. This has proved to be the best possible way to create Pomeranians with icy white coats. If you breed an all white Pomeranian with another white one, you’ll certainly achieve a white puppy BUT the overall quality will diminish rapidly. Both pigmentation and coat are generally the first qualities that reduce. It only takes several white to white generations to be bred and Pomeranian type may revert back to the older type Pomeranian or more German Spitz type. Breeding out to the other colours, may cause other issues. If you want to breed high quality white coloured Pomeranians, you’ll need dedication, a lot of knowledge, many years of your time, and a lot of hard work. Extreme parti colors can be bred to white Poms, the resulting pups rarely ever remain white. As they mature they usually end up pale cream and white parti color mismarks. It is very hard to guarantee the eventual colour of of a white 8 week old Pom puppy. Experience has lead me to only make claims about the dog’s colour after the coat change at 6 to 8 months of age. It seems apparent that there are plenty of “white” shades. Check out white Samoyeds when you attend dog shows and you’ll notice the different coloured whites present. Copyright Dochlaggie Pomeranians. All Rights Reserved. Denise Leo, of Dochlaggie fame. 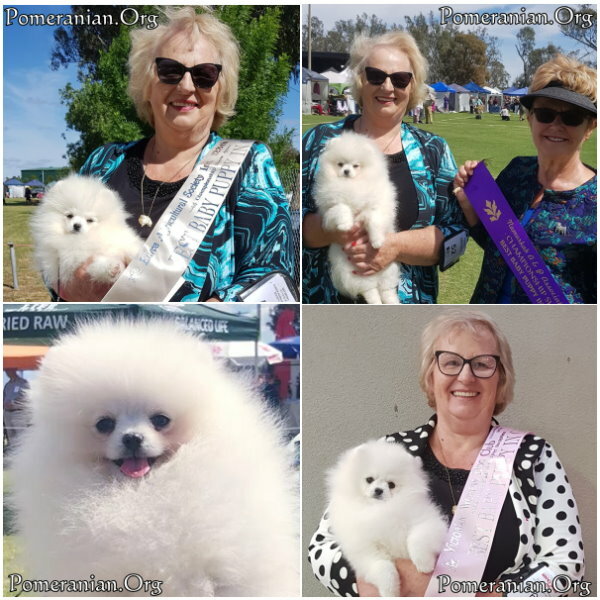 Denise has worked passionately promoting and improving the Pomeranian breed since 1975. 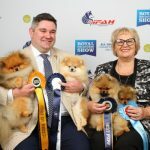 Denise is a Breeder and Exhibitor of Best-in-Show winning Supreme, Grand Champion and Champions and Denise is the breeder/exhibitor of close to 100 Champion Pomeranians. Plenty of Denise’s Winners and Champions have been exported to many parts of the globe. 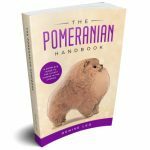 Denise’s extensive little black book includes a long list of very high-profile celebrities from around the world because they have chosen to share their lives with a Dochlaggie Pomeranian. Denise resides in Australia and has been married to husband, Noel, for many decades. She’s a proud mother and devoted grandmother.